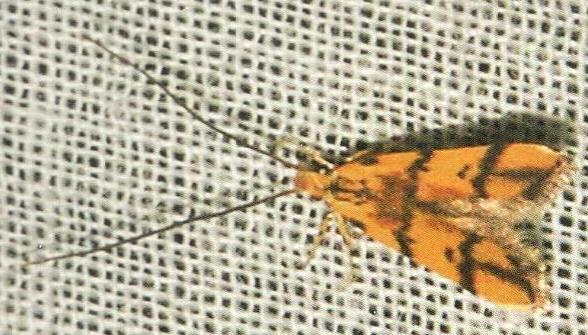 The adult moths of this species have forewings that are yellow, each with two black bands, and other dark markings. The hindwings are pale brown with vague dark bands. The wingspan is about 1.5 cms. Volume 1, Part 19 (1916), p. 592. LeapFrogOz, Kuranda, 2015, p. 102. A Guide to Australian Moths, CSIRO Publishing, 2007, p. 89.